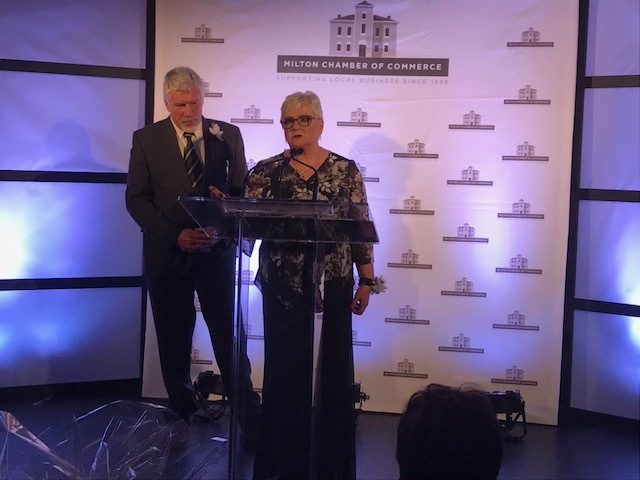 A big congratulations to Liz and Peter Lambrick, who received the Citizens of the Year honour from the Milton Chamber of Commerce earlier this month at their annual Community Awards Gala. Liz and Peter are a highly respected farming couple in Halton Region, known for their deep commitment to both their community and their industry. Together they farm 800 acres of beans, wheat and corn in Campbellville. Liz is a Past President of the Campbellville Community Association, and a key organizer for the Santa Clause Parade as well as the committee that brought the RCMP Musical Ride to Campbellville last summer. She is also known for her roadside market on Guelph Line, Busy Liz’s Farm Shop. Peter is a director with the Ontario Federation of Agriculture, and an active member of the Halton Federation of Agriculture and the region’s natural heritage advisory committee. We are lucky to have Peter’s drive and expertise moving our action plan forward, as he is also currently a Director on the Golden Horseshoe Food and Farming Alliance Board. He was a past Chair of the GTA Agricultural Action Committee, too. Whether working together or separately, the Lambricks’ passion for their community has no doubt had a unique impact on Campbellville. “It does not happen overnight. You have to be prepared to be persistent and keep moving the yardsticks ahead in small doses. It’s the little bits that add up to the big win in the end,” said Peter.